The cylindrical interpolation is available in operations: 2D contouring, pocketing, 2.5D pocketing, 2.5D wall machining. 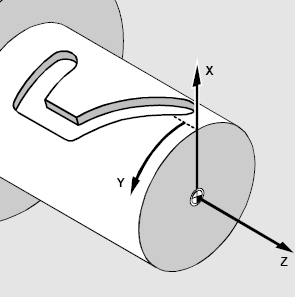 The cylindrical interpolation gives the possibility to mill the side surface of cylinder by programming the unrolled curves. The unrolled curves are programmed in the [X,Y,Z] coordinates, but the cylinder milling is performed in [X,C,Z] coordinates. So the cylindrical interpolation makes the transformation [X,Y,Z] => [X,C,Z]. The possibility to perform the milling of the side surface of cylinder depends on the machine construction. The rotary axis must be located perpendicularly to the tool rotation axis. The tool rotation axis have to intersect the workpiece rotation axis. It must exist the <Rotary axis> that moves the tool in the plane that is perpendicular to the rotary axis. If all listed condition are performed and the machine variable Machine –> Control parameters –> Rotary transformations –> Cylindrical interpolation is available is set then the rotary transformation panel will be available on the transformations page. R – the radius of the cylinder. 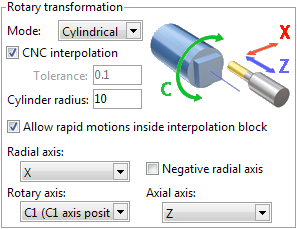 Switch on the cylindrical interpolation mode with the specifying of the cylinder radius. If the machine variable Machine –> Control parameters –> Rotary transformations –> CNC support cylindrical interpolation is set then CNC interpolation tick is available. If this parameter is on then the G-code generated with the commands to switch on/off the cylindrical interpolation. Else the G-code is generated in the [X,C,Z] coordinates. If <Allow rapid motions inside interpolation block> is checked then the interpolation switch on in the beginning of the tool path and switch off in the end of tool path. Else CNC interpolation is started before the work feed and closed before the rapid feed motion.